Hortus Camdenensis | Helichrysum humile Less. Shrub with slender, often unbranched shoots and terminal flower heads with pale pink to deep rose-coloured, papery bracts. To 60cm. [RHSD]. Introduced to Britain in 1810. [PD]. ‘This beautiful plant [Elichrysum spectabile] is from the Cape of Good Hope, whence it was introduced about 1810. It requires an airy greenhouse in winter, and sandy peat soil, with not too much water, and is propagated by cuttings. The flowering season is May and June; the blossoms do not expand in damp or cloudy days: but when the sun shines they immediately display their inimitable brilliancy. When full open, if the flowers are cut off, (which does not injure the plants), they may, by simply hanging them up reversed, be dried and preserved many years, open and in full splendour.’ [LBC no.59/1817]. ABR pl.652/1812. Included as a desideratum in a letter to John Lindley, 15th February 1848, but not recorded as ‘arrived’ in Macarthur’s copy [MP A2933-1, p.157]. It was also requested of Kew Gardens on 1st February, 1849 [MP A2933-1, p.177]. It may not have been grown. Helichrysum humile Less. | LBC no.59/1817 | HAAB. 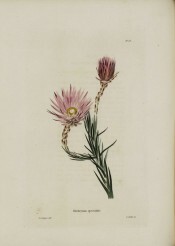 Figured as Elichrysum spectabile.